2nd Flight (36 Holes): 1st – Chad Barnette 147, 2nd – Charles Bradey 150(also low Senior <64) , Dar Shaw 156 (low Super Senior 65>). 3rd Flight (36 Holes): 1st – Mark Robertson 166 (playoff win), 2nd – Reggie Frey 166. 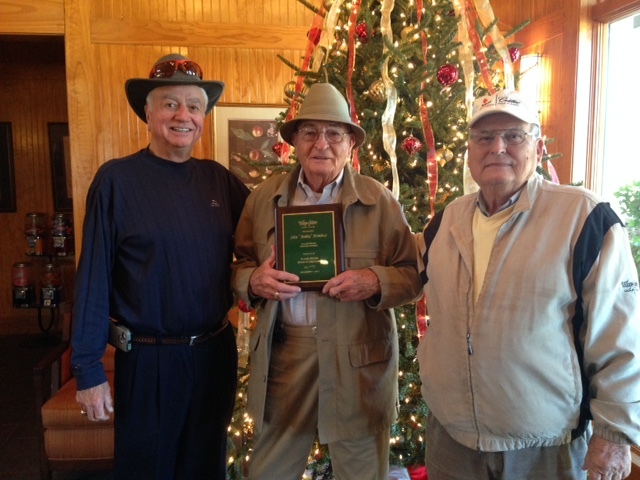 4th Flight – (36 Holes): 1st – Jerry Gaines 173, 2nd – Jack Hall 177. “Lifetime Membership” honorees presented award by co-owners Ben Gramling and Gerry Gaines. Congratulations to John Hembree and Jack Mabry. The golf course is in terrific condition, clean Bermuda rough, smooth putting surfaces and good fairway turf. We pride ourselves in being very golfer friendly. We are known to have one of the best draining golf courses in the upstate and consequently, “cart path only” restrictions are very rare. Village Greens offers single and family memberships as well as corporate memberships. These memberships provide dual course opportunities at both Village Greens and our sister course River Falls Plantation. Check with VG General Manager Travis Sloan or River Falls Plantation membership sales associate Sterling Case for any questions. There is also a membership tab on this website. Are you a senior golfer 55 or older and are looking for a group to play with? Our Wednesday Senior Dogfight, the Hump Day Hackers”, is organized and led by Thom Carney. He has a great group that tees off at 9 am. (10 am during cold weather months Nov-March). 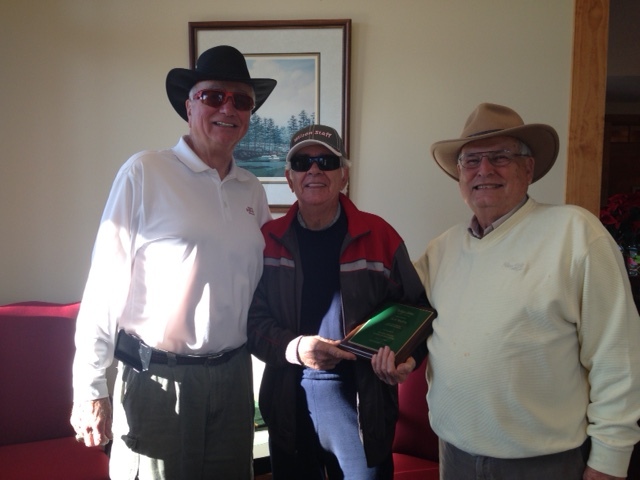 They play different handicapped formats each week and welcome all golfers 55 and older. Call golf shop for details or show up at 8:30 am (9:30 am in winter) that day to get involved. More “Seniors” information is available on this website or www.humpdayhackers.wordpress.com. The Golf Shop hours are 7 A.M. to 5:30 P.M. Range ball sales are from 7 A.M. to 5 P.M. Tee times are not mandatory but recommended. The golf shop will ask 2-somes to be paired up or to be patient when the golf course is crowded with 4-somes. .
No 5-somes on Weekends or Holidays, but is allowed through the week. A $10 cart fee will be charged for a group that requires an extra cart. I.E.—4 players needing 3 carts—2 players needing 2 carts, etc. One must be at least 16 years of age to drive a golf cart. Village Greens’ hosted Corporate and Charity outings are very popular and we expect this year to be just as busy as last year. Those interested in scheduling an event are urged to book as soon as possible. We do employ a “first come, first served” basis. Call our golf shop to speak to myself or our General Manager for availability, competitive pricing, or any additional questions or concerns. Again, thank you for everyone’s support. A player may deem he or she is going to hit a provisional ball if one thinks their golf ball is out of bounds or is lost. A player does not play a provisional ball that may be lost in a water hazard. After a provisional ball is struck and in play a player may strike his or her provisional ball up until the point no closer to the hole than the players original ball found or in bounds.